In 2018, Food & Wine named this recipe one of our 40 best: No one will contest that Union Square Cafe was one of the defining restaurants of the early ’90s. Critics and diners were delighted by Danny Meyer’s devout attention to hospitality and couldn’t get enough of chef Michael Romano’s remarkable greenmarket-centric American-Italian food. 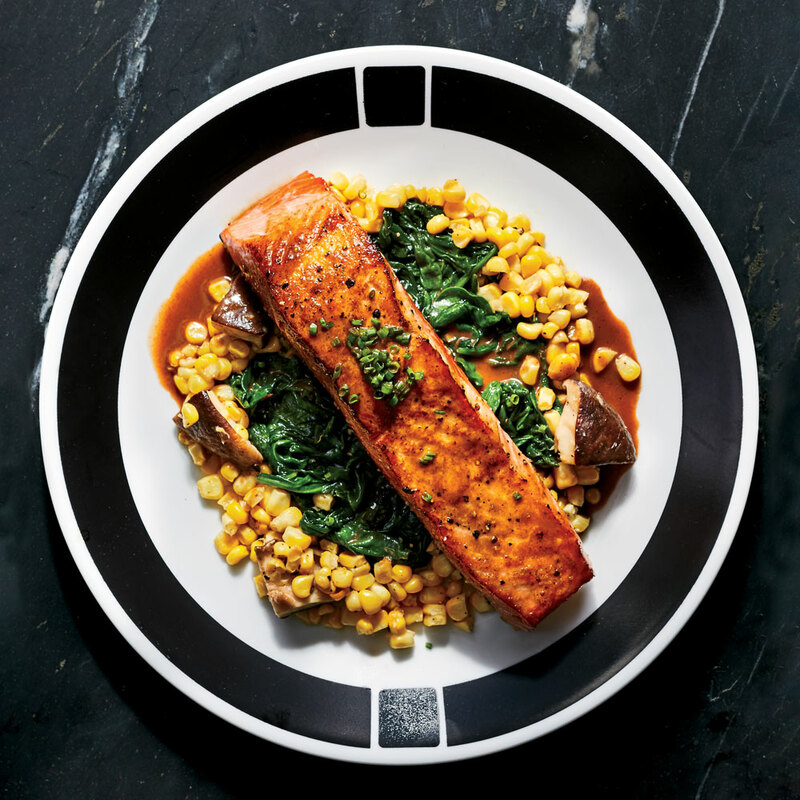 Certain dishes defined the restaurant, including Romano’s seared salmon, which was one of the most popular items on the menu and one of the best recipes we ever published. The myriad vegetables in the recipe—corn, spinach, shiitakes, and tomato—sing of late summer. This recipe serves three to four as a main course and can easily be doubled. Cut 6 tablespoons butter into 1/2-inch cubes, and refrigerate until ready to use. Melt 2 tablespoons butter in a medium nonreactive saucepan over medium-low. Add onion, sliced garlic, shiitake stems, tomato, black peppercorns, and bay leaf, and cook until vegetables are soft but not brown, about 12 minutes. Add balsamic vinegar and 1/3 cup water, increase heat to medium-high, and cook, stirring occasionally, until mixture is syrupy, about 4 minutes.